Hello all! The weather is so unapologetically hot. I hate it so much! What kinda more annoying is, there was thunder rumbling and yet there's no rain. So anyway, today is week 2 of my break. Did do a few stuff this week. Had a medical check-up, went to see Marina Barrage, watched Shrek, and had lunch with Ms. J and The Flying Nun. As I mentioned, the weather has been really hot that it was quite a torture exploring Marina Barrage. You can see some pictures here. 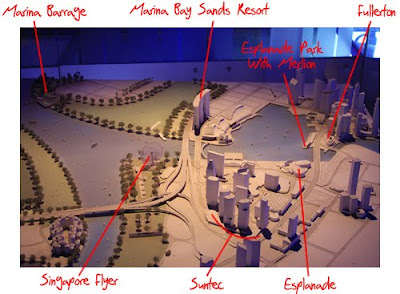 There's a maquette of that area of Singapore and I tried to mark the landmarks. I have to embarassingly admit that I had to think hard on some of the landmarks. I hope I didn't get any wrong. Here you go. Hope it helps you get an idea of the location of each place in relation to the others. 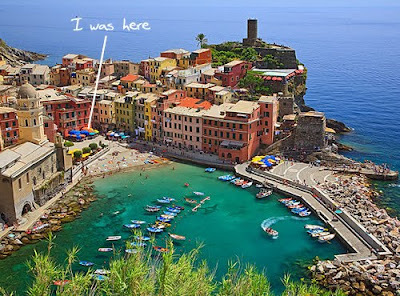 Speaking of pictures, I get my dekstop wallpapers from Webshots and one day I happened to stumble of this picture of Vernazza. It was bitter sweet because I was there. I was sitting down in the cafe with the colorful umbrella taking reprieve from the hot sun with some Americans and an Italian guide. The New Yorkers nicely treated us for some cold water. I remembered that the waiter was of an Arab descent or originally from Arab. Like anyone in the tourism industry, he could speak many languages. Anyway, I didn't realize how beautiful this little area is when I was there. Looking at the picture, I saw how beautiful it is and it's kinda sad for me that I didn't discover that. Today in class, Mr.N labelled me as someone who is 'open' to other people. Darn, since when I become the 'open' one? Am I not the 'closed' one. Somehow being labelled as 'open' doesn't go down well for me. I was thinking maybe I should be more quiet from now one. I am not that friendly of a person and somehow I don't want to be perceived as one. Okay maybe I used the wrong word. Maybe I am friendly but I am actually really really shy. I still don't want to try to start a conversation and introduce myself in a group of strangers. It's just not me. It surprises me how I don't like to be seen as one friendly bubbly person. I know it's weird and no I don't want to change. But the fact is maybe I am changing :( Today in class I also realized how structured my thoughts are. It doesn't seem to give much rooms for creativity. I am so serious in my thoughts and opinions that it gets pretty boring for me :( I realized how other people can be so interesting in their thoughts and opinions. However at the same time I also felt that they may not address or answer the question properly. My structured brain is so boring and uptight. I have become so into problem - solution, that I perhaps have lost the ability to see that problem may not be a problem and a solution may not be needed. I don't know if you get what I mean. Speaking of being serious. A lot of the TV series that I am watching is ending (Ugly Betty, Lost) or ended for this season (House, Grey's Anatomy, How I Met Your Mother), or is ending for this season real soon (Glee) that I was wondering what's the next TV series I should occupy my brain with. Well I have The Big Bang Theory, but that's only 1 replacement for the many which end. Then I tried watching Gossip Girl and man!!! I was thinking how people can watch this and don't feel like they are getting dumber. Maybe I am not a teenager anymore that I don't find interest in this or perhaps I have become that serious that I don't find it brainy enough. It's not like Lost which I really like and not as witty and meaningful as Ugly Betty and Glee. I thought the only interesting thing about Gossip Girl was Penn Badgley. Even so, I don't think it will be enough to capture my attention for the whole 3 seasons. On other pop culture talk, I keep on forgetting to write this. I recently acquired Train's album Save Me, San Francisco and I really really like it. I think if I have to answer what kind of music that defines me, somehow I feel that this define me well. Some people may find it pretty ordinary but maybe at the essence I am ordinary? Another self-contradiction of me. I am hungry now and as usual someone out there is cooking something that smells so nice, aaarrrghhhh!! !